Leeks are one of our favorite vegetables. We use them for soups, salads, stocks and here in a puree and garnish form. About a week ago the weather here was very fall like. We had just gotten over a bad snow storm and once the snow melted we returned to cool air and very windy skies. We decided that crispy leeks with salmon over a leek puree would be the perfect dinner for a night in by the fire. We began by slicing the leeks and cleaning them. 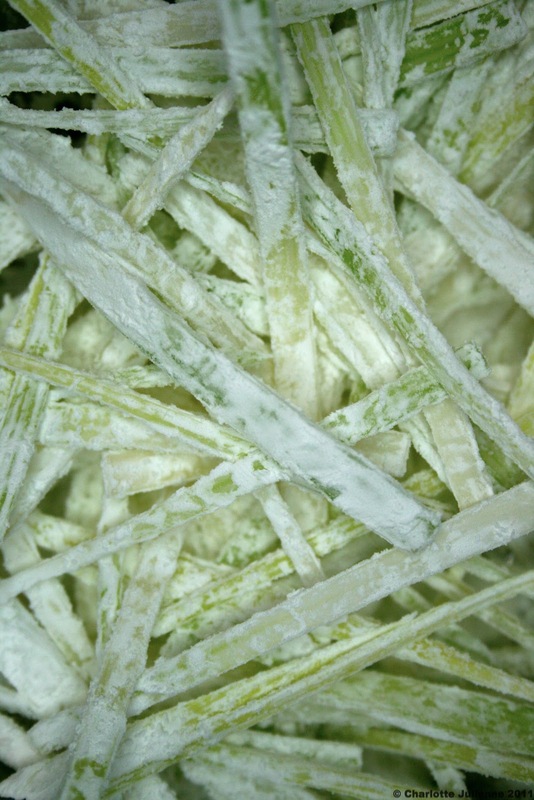 The green portion of the leek was chopped into small cubes and soaked in a water bath. The whites were julienned and also soaked. After the greens were washed thoroughly, we blanched them in boiling water and drained them (reserving a little of the blanching liquid) and then blended them with about half a stick of melted butter and the remaining blanching liquid. We then took the whites and tossed them in cornstarch. We brought canola oil to a boil and added our leek whites cooking them until crispy. When we removed them from the oil we tossed them with some kosher salt and let them rest on a paper towel. We purchased a nice piece of salmon and cut it into smaller portions. The salmon was seared skin side down in a hot pan and then put in the oven at 350 for about six or seven minutes. We plated this by layering the leek puree with some baby potatoes which had been sliced into 1/4 inch rounds and cooked in olive oil, the crispy skinned salmon and topped with the crispy leeks. We drizzled olive oil over the top before serving. It really was the perfect dinner for a cool fall night and we enjoyed it while sitting in front of the fire with a lovely bottle of white wine.